We baked this cake for my sister's Baby Shower. The theme was Noah's Ark so we took advantage of the theme. 10. Finally place Little People's Noah and Animals and it's finished! For the little house, we used Rice Krispie treats then covered with fondant and decorated as seen. Oh my goodness! 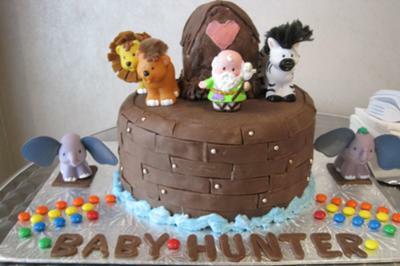 This is the cutest Noah's ark cake! Those little people characters are adorable. I thought they were made of fondant at first. ;) I love how simple yet cute it is. Thanks so much for sharing your cake photos with us girls!